Reading this series was a challenge. It demanded the reader's participation in the series' own narrative (both figuratively AND literally). The box in which its purpose was purposed is a coffin, a bulletproof one at that, and, as readers, it was with our own shovels that we did the disinterring. And that's one of the things that, for me, made this series one of the best of 2012. It spurred the creative urge. Hine and Kane played the joyous tricksters, bearing presents for those who were willing to unwrap them, and explosions for those who were not. 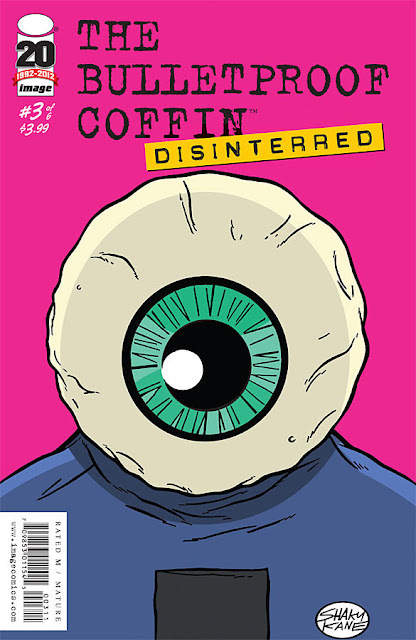 Bulletproof Coffin: Disinterred was a series that self-consciously stood outside of the mainstream, festooned with garish colors and a face full of clown make-up, dancing on the edge of our peripheral consciousness and trusting that those of us who cared would cue up another song and join in wearing our own oversized shoes. Reading this series pumps us with creative juices. I call this the Bulletproof Coffin Effect and you can see it manifest in our review, or even better when Silva wrote this. The Bulletproof CoffinEffect, it just makes you want to go create once it gets hold of you. Everything about this series was either an embrace or an assault; it was up to you to decide the tenor of the meeting. I think we can all agree that it is in this decision and the trust inherent on both sides it entails that elevated Bulletproof Coffin: Disinterred onto this list. This series took the conversation between creators of comics and readers of comics to a different level, perhaps a higher plane, and I thank Hine and Kane for that nod of respect both to me as a participant and to the medium I love.